We extracted this from an 1896 United States Geological Survey topographical map of the area. 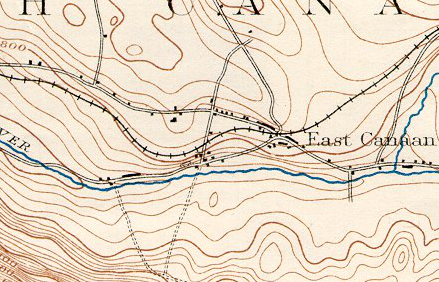 We selected this particular edition of the map because the railroad was there (although not all of it — particularly the sidings) is reflected here. There are clues on this map about why this site was selected for building Beckley and the other furnaces. As well, 1896 was a time when three furnaces were active in the immediate area. The Beckley Furnace complex is located on the Blackberry river, in the lower right hand section of the map, slightly to the west of East Canaan. The iron ore that was used at Beckley Furnace came from an area about five miles west of the left edge of this map. The limestone came from quarries within a mile of the furnaces. The charcoal initially came from the mountain directly south of the furnaces, but ultimately it came by rail from as far away as Vermont. Something to think about: Why do you suppose Beckley and the other East Canaan furnaces were built where they were? Why not on the mountain to the south? Do the contour lines in the topographic map (see the close-up below) give you any clues? Notable on the map is the limited number of black dots indicating a structure. One would expect that there would be more structures shown in an area that contained three working blast furnaces as well as ancillary structures, like charcoal sheds and houses for workers and their families. In this view you can clearly see the Beckley complex, the site of East Canaan #1 (the Forbes furnace), but, oddly, Furnace #3, known as the “Furnace in the Field” is not shown on the map, although we know that it was in operation at that time. We ascribe this to an error by those preparing the map.